The all new Batman v Superman: Dawn of Justice has just hit theaters but that doesn’t mean you can’t pre-order your digital copy of the movie. Over at the Google Movies & TV portion of the Google Play Store, you can now place an order for the Ultimate Edition of the movie for $19.99. This extended version of the movie gives you around 30 minutes of additional footage and in comes with the original theatrical version of the movie too. So for the same price as the movie only, you are getting the extended version too. This isn’t the first time Google has made pre-orders available of movies still in theaters available. The most high profile one has likely been Star Wars: The Force Awakens but others movies like The Revenant have also been available to pre-order while still playing in your local cinema. Doing a pre-order assures you that you will have the movie the day it is released in digital format. Keep in mind, if you haven’t done a pre-order, essentially by placing the order you are holding your future copy of the movie. You will not be charged until the release of that movie and you can cancel at any time up until the release date in digital formats. Once it is released, it will automatically be loaded to your Google account so you can play it on any of your compatible devices or cast it via Google Cast from your devices. 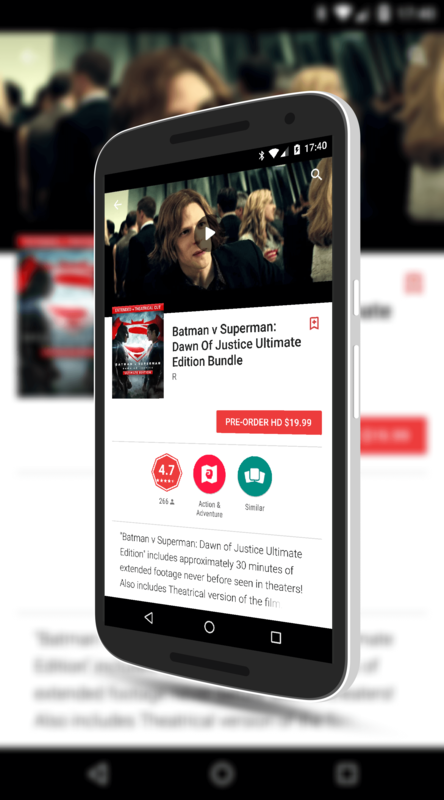 If you are curious as to what other movies you can pre-order at the Google Play Store, there is a dedicated section in the store for them.